Questions about content marketing ROI are probably the ones I hear most from marketers who are struggling to build their own business case internally. We know our customers are turning out advertising. And we know that as consumers, we are all consuming more information online. We are looking to get informed and we are looking to be entertained. We don’t care where the content comes from. But we aren’t sitting around waiting for it. And we won’t go too far to find it. But building the business case is often a tricky proposition. We can’t point to the advertising guy and make it all about him. It is also important to remember that everyone inside the business creates content. And creators love their content like a mama loves her baby. Although the content may stink, we can’t call anyone’s baby ugly. How do we build the business case for content marketing and answer the ROI question before we even really get started? It starts by building a strong business case that doesn’t just directly attack people, their teams, or their budgets. 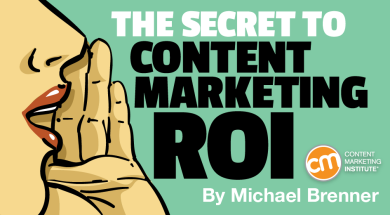 What is the ROI of content? Let’s start with how we answer the ROI question before really even getting started. I point out that content marketing ROI is higher than the average marketing ROI in every place I’ve looked. At Content Marketing World, Julie Fleischer, former senior director for data, content and media at Kraft, said content marketing ROI was four times greater than their most targeted advertising. The first step in responding to the content marketing ROI question is to ask for the baseline: What is your company’s average marketing ROI? Content cost: Conduct a content audit, or at least a sample of the content you produce. Apply some average costs and extrapolate to really gain a sense for how much your content costs. Consider factors such as the cost to create the content including copywriting fees, design services, and don’t forget to estimate the cost of the time for project management. Content utilization: Sirius Decisions has reported that as much as 60 to 70% of content goes unused. Any content that never gets used is 100% waste. You need to not only track content production, but also usage. If you use an agency for your content creation, look at a sample of the content it delivered and then audit your external channels for any metrics of usage. If you use internal resources, ask the campaign managers for usage reports. If you’re like most companies, don’t be surprised at how challenging it can be to track content usage. Content performance: Most people start by talking about page views, social shares, and clicks. But it’s important to first tie your content performance to the business case that got you started in the first place. For awareness and thought leadership content, it’s important to go beyond traffic metrics to look at engagement rates. Anyone can buy traffic. But engagement is the key in today’s attention-starved world filled with so many choices. For lead-generation content, it’s important to look beyond leads to measure both the quality of the leads (conversion rates) as well as engagement. Ask for your overall or average marketing ROI. See if your business understands the cost of the content it produces. Find out how much of it gets used. Ever. I’ve never seen any business over 50%!!! Promise to build a business case and measure the return. If you’ve survived long enough to want to learn how to build the business case, there are a couple of ways to create it. Your fair share of the conversations – What percent of online conversations on your product category are branded? What percentage of those conversations is from or about your brand? How different is that from your market share? If there’s a gap, it means your competition is wooing your prospects before you. For example if you have 25% of the sales in a product category, but your digital content only represents 5% of branded conversation online, you are not reaching your online fair share. Your SEO agency or even some of the SEO tools like SEMrush can provide you with your online fair share. Unbranded search traffic on your website – How many of your early-stage prospects find your company website? You can identify this by looking at search traffic from brand terms vs. unbranded search terms. If you’re like most brands, you promote too much on your website and you need to build a brand publishing capability. If you write more about the trends in your industry, you will not only be seen as an authority, you will attract more unbranded search traffic. Banner effectiveness at driving brand visits – If your company spends marketing budget on digital display (banners), test the effectiveness of this approach at delivering traffic to your website vs. content marketing. Cost of advertising / search landing pages with low organic and social traffic – While advertising landing pages are built to deliver on the advertising message, measure the bounce rate of these pages and the amount of organic search or social traffic these pages get. Consider building a content marketing experience to serve as the landing page for your advertising. This will deliver “free” search and social traffic on top of your paid ad traffic. Cost of organic and social website traffic vs. paid – Content marketing allows you to gain additional reach, engagement, and conversion without having to pay for it. You can literally earn your audience’s attention without buying it. One simple way to calculate this is to look at your average cost per click from paid search. Apply that number to your organic and social traffic to get the value of these visitors. Cost of content that goes unused – While this business case applies to any buyer stage, it is often one of the biggest marketing expenses. And any content created and not used is just pure waste. Time spent, bounce rate on content- vs. advertising-landing pages – This comparison should reveal how content marketing helps your brand reach early-stage visitors, engage, and convert them to sales. Repeat visits, and time engaged with your brand – Repeat visitors came to your site once and then they came back for more. Measure the impact of these visitors by looking at their conversion rates vs. first-time visitors. Value per subscriber – Quantify how many prospects you literally bring into the brand fold so you can start to market to them. You can quantify their value by looking at revenue or lead value from your email list divided by the number of emails you have in your database. Leads and sales from subscribers – Every lead you generate from content marketing can be valued. Anyone who registers for one of your white papers or events can be valued. Every subscriber you generate to build your list can be valued. Content marketing ROI vs. overall marketing ROI – Once you’ve identified the previously detailed data, calculate the ROI of generating these subscribers, leads, and sales vs. the brand’s overall marketing ROI. Retention and lifetime value – Measure customers who engage with your content marketing and determine if they spend more or stay longer as customers. Content marketing can serve to deliver more engaged and profitable customers. To answer the content marketing ROI question for your business, you need to build a solid case based on a deep understanding of your business. What is your business’ average marketing ROI and how can content marketing achieve a higher return? The answer comes down to understanding your content costs, usage, and performance. From there, you have a few paths to building a solid business case that will allow you to reach new customers, engage them with your brand in a meaningful way, and then convert them to new sales and long-term relationships that provide real ROI. Learn more insights and practical tips from Michael Brenner in person when he presents at Content Marketing World this September. Register today, using the code BLOG100 to save $100. Michael Brenner is a globally-recognized keynote speaker on leadership, culture, and marketing. Co-author of the bestselling book The Content Formula, Michael's work has been featured by The Economist, The Guardian, and Entrepreneur Magazine. In 2017, Michael was named a Top Business Speaker by The Huffington Post and a top CMO Influencer by Forbes. Follow Michael on Twitter @BrennerMichael.